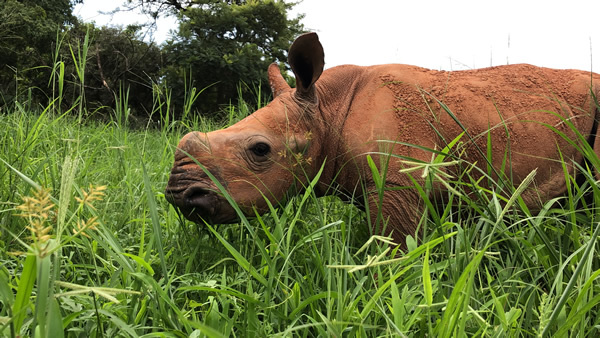 Members of the public noticed a very young, female, white rhino calf running in the bush on her own near the Jock Safari Lodge and alerted the Kruger National Park Rangers. She is estimated to be around two months old. Witnesses say that the calf had been on her own for about 2-3 days. It is suspected that her mother had been killed by poachers. Kruger National Park Veterinarian, Dr. Peter buss was called in to rescue the calf, with the help of a helicopter. The calf was stabilized and flown to Care for Wild Rhino Sanctuary to begin her rehabilitation on the 28th of November 2018. Everyone was grateful that this little calf was in good condition and had no wounds, a miracle considering the time alone in the bush. Just hours after arriving at Care for Wild Rhino Sanctuary, the little calf began drinking milk from a bottle. The next day her earplugs and blindfold were removed and she settled in to her new environment quickly. She was weighed and found to be a mere 82kg! She is drinking her milk every three hours, and sleeping well too. She has also been playing and running around in the ICU boma, enjoying the fresh air and the sunshine. A perfect little baby rhino. We are happy to report that Ribbon has bonded very well with one of the other orphaned rhinos, Lazuli. They are both drinking and growing well, spending the day grazing and napping under the trees. We would like to thank everyone involved in this little calf’s rescue; Jock Safari Lodge staff, SANParks Kruger National Park’s rangers, helicopter pilot and veterinarians. We are proud to be part of this amazing group of people dedicated to saving the rhino, one baby at a time.